A driving force and major decider figure in the margins of SBIFF goes by the name of Oscar. The strategic timing of SBIFF, in the build-up to the Academy Awards and shortly after the naming of the nominees, enables the festival to secure participation from many Hollywood artists with Oscar on the brain. Oscar also anoints us via the screening of all or most of the Foreign Film nominees and official entries from around the world. The list this year includes the art-fueled and fabulous Swedish film The Square, the socio-emotional Lebanese film The Insult, the creening of On Body and Soul, and the unique Chilean concoction known as The Fantastic Woman, which screened on Thursday night before a hefty crowd, and with the intellectually adroit Chilean-in-Berlin director Sebastian Lelio in the house for a fantastic Q&A. What is this film? Hard to say, and therein lies much of its beauty. Lelio tells the tale of a transgender woman (the remarkable and magnetic singer-actress-model Daniela Vega, who we don’t mind watching wander the streets of Santiago for a couple of hours), whose older lover dies, creating rifts with the man’s wife and family, and with unresolved issues in the lurch. The film proceeds, with a sensual cinematic sense of style owing to melodrama, the sleeker side of film noir, subtle ghost story implications…and more. Somehow, the varying threads conspire toward a seamless, if slippery whole. In a sense, the film behaves like a mystery lined with Martin Herbert’s enigmatic but never leading or misleading musical score. But it ends up a mystery unto itself, not quite like anything I’ve seen before — something compelling and perplexing, by turns. The movie’s purposefully fluid identity and range of influences and references — including Douglas Sirk and Louis Malle’s masterpiece Elevator to the Gallows — makes it especially satisfying for cinephiles who both revere history and search out fresh ideas in the medium. Lelio speculated that maybe “the correct way to make it would have been in the raw light of realism with hand-held camera.” Instead, he went elegant, with “classical calligraphy. It starts like a mid ’50s melodrama and then starts something new, but by then, you are hypnotized.” He’s got that one right. Site-Specific Fandom: Off to the sides of Oscar’s dominion, this has been a stellar year for SBIFF’s U.S. Premiere component, a distinguishing mark for any festival. Among the memorable goods staking their first claims have been the Albanian Daybreak, the Icelandic wonder The Swan, and the Spanish film-about-film Sad Hill Unearthed, an inspiring entry. More specifically, it’s a film about both film and the importance of scholars and rabid fans whose passion ennobles the art form of cinema. This translates to a film about a volunteer group in Burgos, Spain, who so loved Sergio Leone’s landmark film The Good, The Bad and the Ugly, that they mobilized efforts to painstakingly reconstruct the famed, epic cemetery showdown scene in the actual location in Northern Spain. Director Guillermo de Oliveira (also involved in making a documentary about flamenco guitarist god Paco de Lucia) discovered the project, and got busy, chronicling their efforts and passions leading up to the major 50th anniversary unveiling in 2016, and fishing for relevant interviews: He got some, including Clint Eastwood, the great composer Ennio Morricone, and Metallica singer and Leone fan James Hetfield, and a goofy interview clip with Leone himself, speaking between bites of pasta. It was a multicultural affair: an Italian film in the American genre of the western — and ultimately one of the greatest westerns ever made — shot in Spain. Though not mentioned in the documentary, among Leone’s fans was the late, great German director Rainer Werner Fassbinder, who opted to shoot his own quirky spaghetti western Whitey on Spanish sets left over by Leone, and then returned for a cynically satirical film-about-film-about-Fassbinder’s brain, Beware the Holy Whore. And we saw it here first. 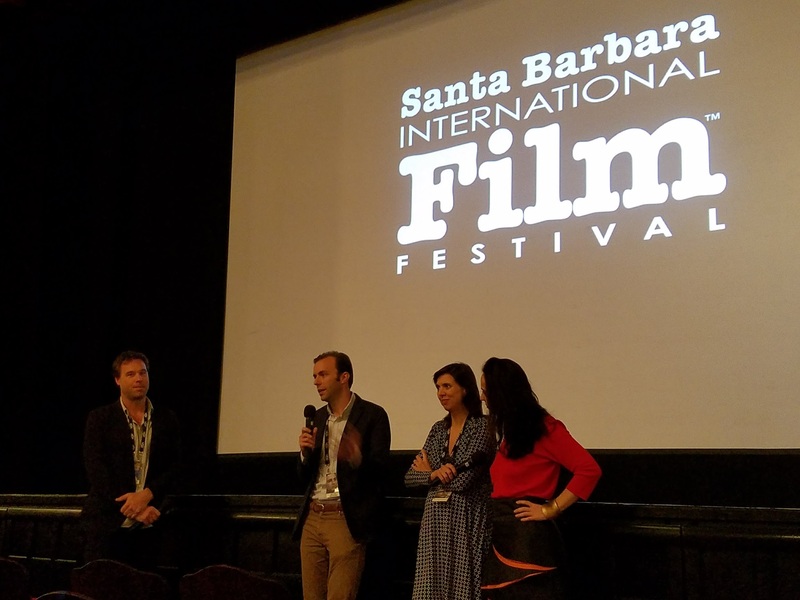 As SBIFF programmer and interviewer Michael Albright told the audience who stuck around for a Q&A, this screening allowed us to see the film before any Spanish audience, or Clint Eastwood himself. Oliveira told the crowd he was something of a nerd, an unabashed Leone fan and very much into the “production archeology” of legendary film locations. Bumping into the early rumblings of the reconstruction project, he said, “I started asking ‘What was driving them to do that?’” Of course, part of him understood completely. “They believed in this dream,” he said. Films to See: Another example of an Oscar bid from a certain country comes to us from the too little-known cinematic locale of Kosovo, which put forth the impressive, gritty but emotionally and societally deep film Unwanted, from director Edon Rizvanolli. The film is part of a ripe new sidebar series at the fest, Crossing Borders, showcasing films dealing with immigration issues and border-related tribulations. Nothing could be more pertinent to this simmering, volatile tale of a mother and her restless, quick-to-explode young son, whose source of angst and trigger finger emotionality stems back to the still-lingering personal, ethnic, and regional wounds of the Serbian aggression 20 years earlier. The deft pacing and storytelling grace of the film is plotted with minor depth charges and revelations, building up to a late-breaking unveiling of source of the inner pain festering in these characters and in the Balkan soil. The war is over. The war continues, inside (mostly). From Sweden, but beyond the realm of white Swedish life, Rojda Sekensoz’ Beyond Dreams is an inviting and sometimes sobering view of hard scrabble characters living on the edge of subsistence and petty crime. We meet our protagonist Mirja (a captivating performance by Evin Ahmad) as she is released from prison, joining her female homies in a mini-gang that dreams of a trip of Montevideo while plotting the next robbery. Mirja toys with going straight, working in a hotel while resisting the pull to the dark side again. The well-crafted film offers up another side of Swedish life, on the fringes but from the heart. Meanwhile, at the Breakfast Club…Friday morning’s menu included the Danish film You Disappear, writer-director Peter Schonau Fog’s intriguing if uneven semi-courtroom drama. A school principal, accused of embezzlement, pleads “temporary insanity” caused by a brain tumor. He behaves badly, and strangely, at home — especially with his suffering wife, who may not be as rational as she and we think — and elsewhere, becoming the impetus for a drama interspersed with neuroscientific observations about the mysterious functioning of the brain. A meandering quality blunts the potential impact of the film and keeps us at a distance, but there are enough fascinating themes and points of dramatic tension to keep us tuned in, all the way to the proverbial verdict.